I would recommend you edit the post to reflect that. You can quote part of what he said (just as I did here to you), or simply interpolate @a_langwich at the top. are an awful lot of plain old horses out there. But - zebras exist. And the best way to find a zebra is to look for one. its best. Extraodinary claims require extraordinary proof - and the team is working on providing it. So yeah, I'm expecting a horse. While it is interesting to theorize on how and why EM may work and even more interesting to speculate on what the ramifications and applications of EM may be I would suggest that it is far more important to adequately fund experimental research to prove or disprove that it works at all. I know that there are many unfunded and underfunded questions in fundamental and theoretical physics that many feel are more important than EM but it would seem to me that clear focus on experimental tests for EM can be done at a fraction of the cost of most others. NASA and other national space agencies are the most likely to benefit immediately from such research and are the logical agencies to fund such research. All the arguments I have seen against EM rest on the lack of theoretical foundations, but eppur si muove! I remain a hopeful skeptic. Hopefully further funding will become available as public interest grows. Thank you for writing this article. It nicely distills much of the information that has been posted here on the forums into a comprehensive and easy-to-read article. I've posted a link on Facebook, in hopes that my skeptical friends will be a bit more open to the idea of the EM-drive and the possibility of warp drive. Yes, adequate funding has been a huge issue to properly validate, or to nullify, the EM Drive. For example, NASA's EM Drive truncated cone was made by Paul March (an engineer at NASA Eagleworks) himself in "his wife's dining room". Before we gets lots of questions about terrestrial applications. Q. How can the EmDrive produce enough thrust for terrestrial applications? A. The second generation engines will be capable of producing a specific thrust of 30kN/kW. Thus for 1 kilowatt (typical of the power in a microwave oven) a static thrust of 3 tonnes can be obtained, which is enough to support a large car. This is clearly adequate for terrestrial transport applications. I assume that everyone here understands how important that quote is to their claim. From the article, Yang is reporting a thrust over power efficiently of nearly T/P = 1 N / kW, but March is projecting 500 to 1000 Newton/kW in 50 years time, though White's crewed missions to Mars is based on only 0.4 Newton/kW. If constant efficiency were allowed, then with kinetic energy KE = 1/2 m v^2, dKE/dt = m v a = F v, so by the time a speed of v = P / F is reached, the kinetic energy would building at a greater rate than power is applied to the drive, so if you could do such a thing on Earth you could harness an engine to generate more power than it consumes, producing clean, cheap, unlimited power. For Yang T/P = 1 N / kW, this break-even velocity is 1 km/s and for White's Mars ship it is 2.5 km/s, but for March's projected 500 to 1000 Newton/kW it is only 1 to 2 m/s. Q. Is the EmDrive a form of perpetual motion machine? A. The EmDrive obeys the law of conservation of energy and is therefore not a perpetual motion machine. Energy must be expended to accelerate the EmDrive (see Equation 16 of the theory paper). Once the EmDrive is switched off, Newton’s laws ensure that motion is constant unless it is acted upon by another force. What I don't understand, and what I didn't find in the faq, is how the drive remembers what reference frame it is suppose to be measuring its velocity against. If the engine ran for a while to achieve a certain velocity and then shut down and coasted for a while, when it restarted, it must somehow still be tied to its initial reference frame so that it knows it already has some velocity which reduces its efficiency. Do they offer any method by which that could happen? If someone has an explanation on this point I'd be happy to read it. Excellent article. A lot of work went into distilling that huge thread. A small spacecraft could provide unambiguous proof that the effect is real (if it's real). An EM drive satellite powered by PV could behave in ways that are impossible under conventional physics. It still wouldn't be clear what is happening but it would be undeniable that it's very important and worth a lot of funding. What's the cheapest EM spacecraft design that should do clearly impossible things? About $10,000. You could Kickstarter it and get it on the next Dragon flight, ala A3R. Heck, there's cubesats that have flown for less. The reason why the picture shown in the article was chosen is because it is the picture that appears on a NASA report authored by Dr. White. The picture you posted in your post, instead, has "All Rights Reserved" by the artist, Mark Rademaker, a term of art used by artists and content creators to prevent ambiguity and clearly spell out the warning that their content cannot be copied freely. It has not appeared (to my knowledge) in that form, in a NASA report. more than that, that warp-ship was only done in 3D by Mark Rademaker. The original design actually belongs to Matt Jefferies, the original designer of the Enterprise. Considering that BOTH ships images (XCV-330 Ringship and IXS Enterprise) have all rights reserved to Mark Rademaker, wouldn´t be better to contact him asking for permission and use the NEW design commissioned by Dr. Sonny White? 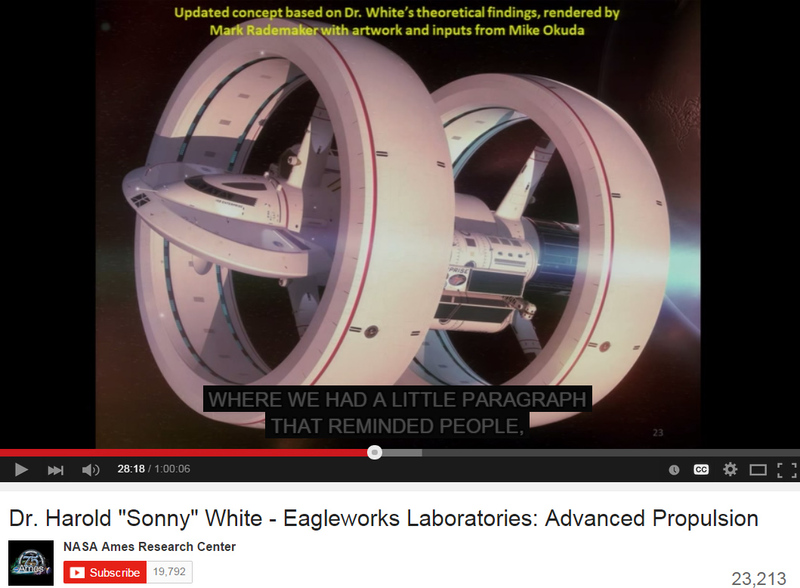 "When I got invited by Dr. Harold "Sonny" White and Mike Okuda, I was absolutely stunned. Did that just really happen? A person from NASA contacted me to do artwork for them? Yes it did! After seeing my rendition of Matt Jefferies "Ring Ship", Dr. White thought that this would be a good starting point for a near future "Ring Ship". At least from a STEM perspective. Because that is the main goal: to get a warpship concept out there that would inspire young people to choose a career in STEM." I find it weird that Dr White did not use the new drawings, since THOSE were the ones he advised Mark Rademaker and in fact, as Rademaker himself says, Dr White personally contacted him to ask him to make it. The previous ship is Rademaker's "Ringship" and is not based in any real Warp drive Concept by Dr White. Rademaker did it from his own imagination, Dr. White liked it and used on a NASA paper, then later decided to contact Rademaker and suggest modifications so the ship would resemble "real warp drive theory by Dr White". "Streaming the conversion of warp-ship to Q-thruster ship. Artist impression/ optimistic concept http://www.twitch.tv/yard2380"
screenshot from the video above, showing that Dr White has used the image on his presentations and probably some powerpoints. I guess the image in the article should be changed. http://emdrive.com/ is maintained by Roger Shawyer (or by someone in his company, SPR Ltd.), I think the predictions written in this website should be taken with a grain of salt since there's no consensus on any theory which could explain the experimental results (whether or not they're an artefact). I have limited understanding of this, but I'm still very skeptical (but hopeful!). The NASA experiments show exceedingly small thrust measurements, to the point where experimental error seems only too likely. The UK and Chinese experiments on the other hand, were comparative high power experiments in the open air that could have caused all kinds of convective effects. There's all this talk of Mars missions, and we are nowhere even CLOSE to figuring out that this thing even works! On the Serengeti plain, no. can anyone explain this point better? Q. Why does the thrust decrease as the spacecraft velocity along the thrust vector increases? A. As the spacecraft accelerates along the thrust vector, energy is lost by the engine and gained as additional kinetic energy by the spacecraft. This energy can be defined as the thrust multiplied by the distance through which the thrust acts. For a given acceleration period, the higher the mean velocity, the longer the distance travelled, hence the higher the energy lost by the engine. This loss of stored energy from the resonant cavity leads to a reduction in Q and hence a reduction of thrust. The key question is why can't you just turn the machine off and start again from a new reference frame, giving you a traditional interpretation of a propellentless drive and free energy. Reading that Q/A, ascribing a 'book-keeping' ability to such a device in regards to reference frames sounds unphysical to me. I can't do anything with that. I tend to believe that Mr. Shawyer might have accidentally found something mind-blowing.. but his explanations just don't add up. It might work for, uh, different reasons than he assumes. Well you might ask how the electrons in the double slit experiment know they are being observed and therefore act differently. Hmm.. I think that using the verb 'to know' in this context bears risk of mixing up human cognitive behavior and physical behavior of particles, that's actually also defined by the 'stuff' that's around it. When talking about EM-drives and Q-thrusters, I think it's correct to start thinking in terms of spacetime-engineering. Just as a double-slit experiment engineers spacetime by producing a local configuration of matter and a specific topology, what we might call Q-thrusters or EM-drives could be equally said to engineer spacetime by producing a local configuration of matter, time-varying energy and topology that possibly induces a hitherto unobserved behavior of QV. It is notoriously difficult to understand what Quantum Mechanics means, but it tells you what is going to happen. In this case I don't know what is claimed to happen if you turn the machine off and turn it back on later. There is a tree of obvious questions that would be best answered by a proponent who understands the maths. So this company SPR Ltd. has been working 15 years on this and the feasability of the concept is still not proven? Well at least NASA is on it now, but I'm not optimistic. What is the image of the bus-sized spacecraft pictured in the feature article? Who came up with that? It looks like a discarded blueprint from the modelshop of Zombies of the Stratosphere!